1. This Ministry brought out the first release of employment related statistics in the formal sector in April, 2018 covering the period September 2017 to February, 2018, using information on the number of subscribers who have availed benefits under three major schemes, namely, the Employees’ Provident Fund (EPFO), Employees’ State Insurance Scheme (ESIC) and the National Pension Scheme (NPS). 2. As mentioned in the earlier series, the levels of employment are from various sources, there are elements of overlap and the estimates are not additive. Detailed information is separately published on the respective organisational websites for the period September, 2017 till April, 2018. The information is based on the number of subscribers and as the schemes provide for earlier payments, the tables reflect a dynamic status. (3) For more details, please visit website of EPFO. (4) For more details, please visit website of ESIC. (3) For more details, please visit website of PFRDA. 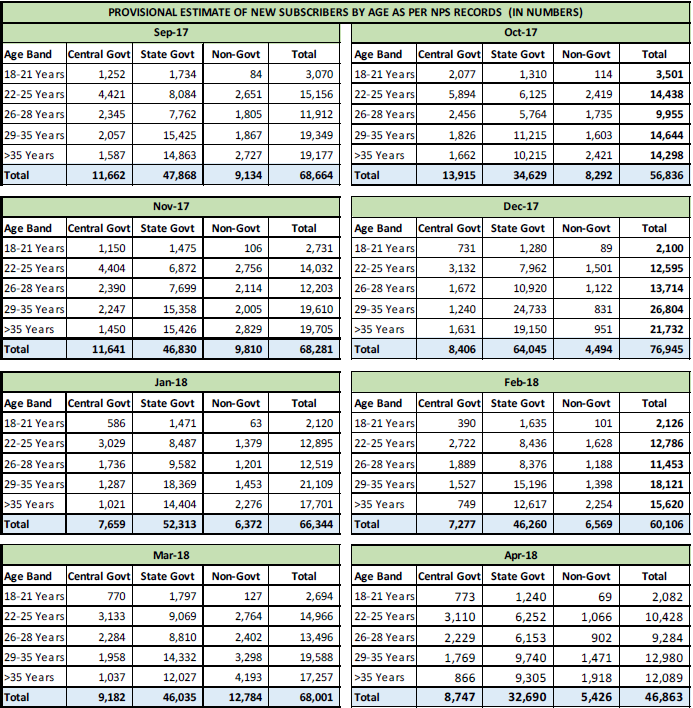 The estimated total number of new NPS subscribers during the period September, 2017 to April, 2018 is 5,12,040 persons. 3. The present report gives different perspectives on the levels of employment in the formal sector and does not measure employment at a holistic level. The Ministry welcomes suggestions for improvement in content, coverage and presentation. 1. The Employees Provident Fund Scheme (EPF) is the main scheme under the Employees’ Provident Funds and Miscellaneous Provisions Act, 1952. It is managed under the aegis of Employees' Provident Fund Organisation (EPFO). It covers every establishment in which 20 or more persons are employed and certain organisations are covered, subject to certain conditions and exemptions even if they employ less than 20 persons each. It is a mandatory savings scheme. The pay limit is Rs 15,000 per month. Persons drawing pay above Rs 15,000 are exempted or can be enrolled with some permission or on voluntary basis. The number of members subscribing to this scheme gives an idea of the level of employment in formal sector. The data on net subscribers is sourced from EPFO. More details are available at EPF site. 2. The Employment State Insurance Act, 1948 is applicable to establishments employing 10 or more workers. For health and medical institutions, the threshold limit is more than 20 workers. ESI Scheme for India is an integrated social security scheme tailored to provide Social Production to workers and their dependents, in the organised sector, in contingencies, such as Sickness, Maternity and Death or Disablement due to an employment injury or Occupational hazard. The wage ceiling is Rs 21,000/- per month. The number of subscribers of this scheme also gives an idea of the level of employment in the formal sector. Beneficiaries are termed as Insured Persons and a new IP number can also arise due to change in employment. Employees who have ceased to pay contribution may be due to wage exceeding the statutory ceiling of Rs 21,000/- per month or due to resignation, death, retirement or dismissal. Data is sourced from Employment State Insurance Corporation (ESIC) and the information will have an element of duplication with EPF data and thus not additive. More details are available at ESIC site. 3. The Pension Fund Regulatory and Development Authority (PRFRDA)’s National Pension scheme (NPS) is an easily accessible, low cost, tax-efficient, flexible and portable retirement savings account. Under the NPS, the individual contributes to his retirement account and also his employer can also co-contribute for the social security/welfare of the individual. NPS is designed on defined contribution basis wherein the subscriber contributes to his account, there is no defined benefit that would be available at the time of exit from the system and the accumulated wealth depends on the contributions made and the income generated from investment of such wealth. Any citizen of India, whether resident or non-resident, individuals who are aged between 18 – 60 years as on the date of submission of his/her application. From 1 st January 2004 the central and state governments have adopted this scheme for new employees except armed forces. This was extended to other establishments from 2009 onwards. More details are available at PFRDA site.